Whether it’s a sunny event in the park, a sweaty gym sponsorship day, or even a mountain bike race, our custom water bottles will help your clients quench their thirst and recharge their batteries—all while remaining brand aware! Help them keep hydrated with our vibrant range of customized water bottles, designed to fit perfectly with your branding to ensure users remember your business, services, or products. Custom Collapsible Leak Resistant Water Bottle 20oz is made of 25% recycled post-industrial HDPE material. Custom Super Sports NEW Water Bottle 32oz is made of 100% acrylic. Custom Recycled HDPE Water Bottle 24oz is made of 25% recycled post-industrial HDPE material. Custom Easy Squeezy Water Bottle 28oz is made from BPA-free polypropylene materials. Custom Frosted Fitness Water Bottle 20oz is made of 25% recycled post-industrial HDPE material. Custom Poly Clear Fitness Water Bottle w-Sipper Lid 20oz is made of PET material. Custom Poly Clear Fitness Water Bottle 24oz is made of 25% recycled post-industrial HDPE material. Custom Collapsible Flat Bottle w-Carabiner 28oz is made of lightweight material. Custom Poly Clean Plastic Water Bottle 28oz is made of PET material. Logo Imprinted Surfside Sport Bottle 26oz is made from BPA-free PET. Custom Poly Clear Gripper Water Bottle 30oz is made of PET material. Custom Poly Clean Wave Water Bottle 26oz is made of PET material. Custom Tahiti Aluminum Sports Water Bottle 25oz comes with single-wall construction. Custom Infusion Filter Bottle w-Straw 20oz is made of durable material. Custom Durable Tritan Water Bottle w-Straw 25oz is made of durable tritan material. Custom Aluminum Two-Tone Water Bottle 25oz is made of lightweight aluminum material. Custom Aluminum Bike Water Bottle 25oz is made of lightweight material. Custom Water Bottle W-Handle 16oz is made from PVC plastic. Custom Sahara Carabiner Sports Aluminum Bottle 20oz comes with single-wall construction. Custom Fluorescent Water Bottle w-Flip Top Lid 23oz is made of lightweight material. Custom Nassau Aluminum Water Bottle 25oz comes with single-wall construction. Custom Rectangular Water Bottle 16oz is made of AS material. Custom Tritan Gripper Water Bottle w-Straw 24oz is made of durable tritan material. Personalized Aluminum Bike Water Bottle 25oz is made of lightweight material. Custom Aluminum Chroma Water Bottle 21oz is made of lightweight aluminum material. Custom Safari Water Bottle 24oz is made of durable tritan material. Custom Fruit Fusion Water Bottle 25oz is made of PET material. Custom Tritan Gripper Water Bottle 22oz is made of durable tritan material. Custom Empire Water Bottle 30oz is made of durable tritan material. Custom Aluminum Sports Water Bottle w-Flip Top Lid 25oz is made of lightweight material. Custom Aluminum Sports Water Bottle 28oz is made of lightweight material. Custom Grip Stainless Steel Water Bottle 25oz is made of stainless steel. Custom Jupiter Water Bottle 15oz is made of durable tritan material. Custom Easy-CleanTritan Water Bottle 28oz is made of durable tritan material. 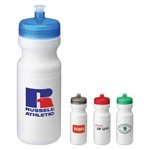 Custom Screw Top Fusion Water Bottle 22oz is made of durable tritan material. Custom Stainless Steel Bike Water Bottle 24oz is made of Stainless steel. Custom Stainless Steel Water Bottle 24oz is made of Stainless steel. Custom US Aluminum Water Bottle 24oz is made of lightweight aluminum. Custom Fruit Fusion Breeze Bottle 24oz is made of durable tritan material. Personalized Save-A-Bottle 22oz is made from Eastman TRITAN. Promotional Canteen Sports Bottle 20oz is made from BPA free 18/8 stainless-steel. Custom Hydration Cascade Sports Bottle 28oz is made from BPA free 18/8 stainless-steel. Personalized Compass Sports Bottle 20oz is made from BPA free 18/8 stainless-steel. Custom Stainless Steel NEW Vacuum Water Bottle 16oz is made of Stainless steel. Custom Stainless Steel NEW Nimbus Water Bottle 16oz is made of stainless steel and plastic. Distribute these handy accessories as giveaways at promotional events and take advantage of budget-friendly bulk orders. Your target market will always need to stay refreshed; help them do so, and remain at the forefront of their minds every time they take a gulp. If your business is looking for customized water bottles, Logo To You is your one stop shop. 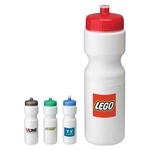 We carry a wide selection of custom water bottles to choose from, and all items can be altered to your specifications. Our range includes BPA-free plastic, acrylic, and aluminum sports drinkware to keep your clients both happy and healthy. Our styles are varied and bound to suit the needs of any business or individual. Whether your clients will take them camping, to the gym, or on the road during business trips, they’re the perfect way to get your brand and message mobile. Associating your brand with health and activity can’t hurt, either! This is an item everyone uses at some point, making them a functional marketing tool that won’t be thrown away immediately your lead gets home. Print your business’s name on the item and sponsor a local sports team, charity gym event, or golf day. Participants will be grateful for the hydration after a day out in the sun or a tough workout. When you place your order, take advantage of our art service, proofs, and exact re-order setups within one year of the original order, all at no extra cost. Our accessories are easy to personalize, and can be ordered with just a couple of mouse clicks. Choose your style, color, font, and graphic and place your order today. If you have any concerns about our high-quality products, please get in touch with our sales staff.